“Uh oh,” said the Continental soldier standing in front of me at Washington Crossing State Park, the New Jersey side of the Washington Crossing PA/NJ duo of parks. 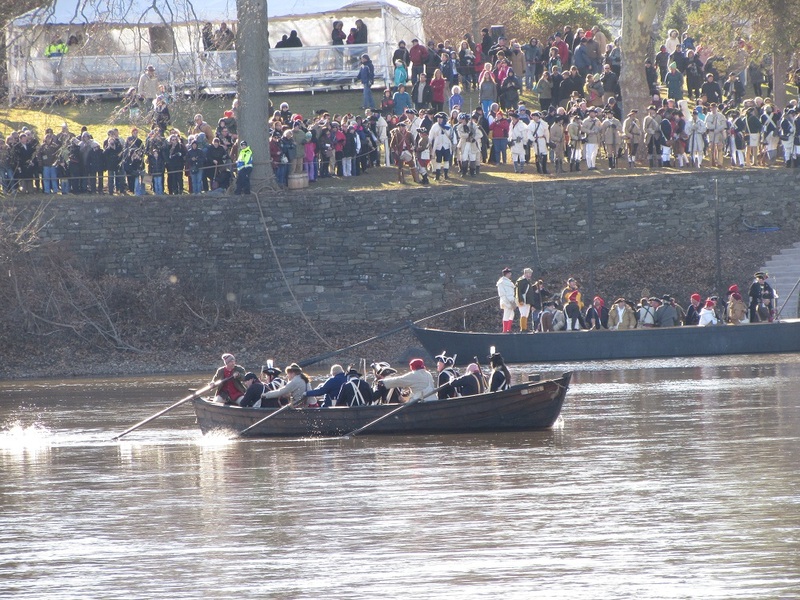 We’d just watched the first of the boats carrying the Continental Army across the Delaware River push off from the Pennsylvania side and now they were drifting down stream. There’d been a lot of rain the week before, the water was high and choppy, and no amount of frantic rowing was straightening their course. The three soldiers waiting for them in Jersey picked up their portable wooden gangway and scurried further down river. But that’s the purpose of a rehearsal, right? To practice for the actual event? 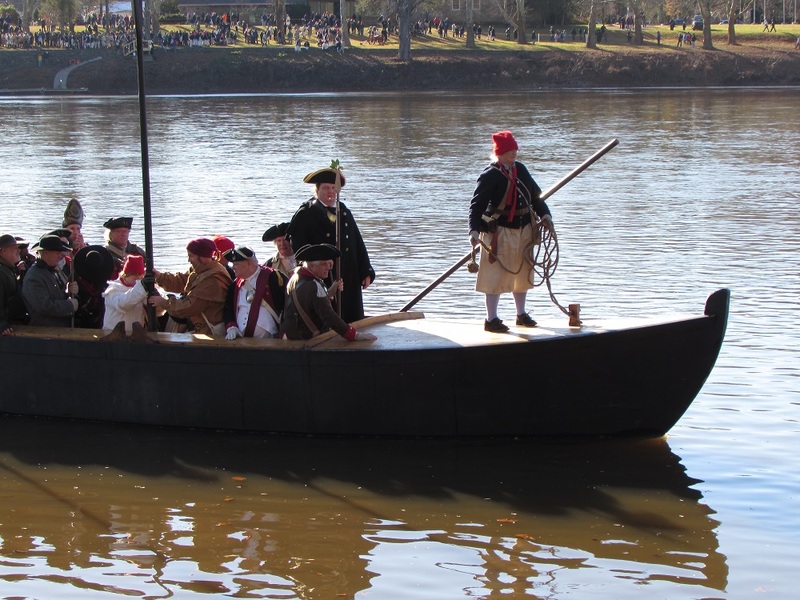 So I hope that all goes well today, because that was the dress rehearsal for the annual Christmas Day reenactment of George Washington and his troops crossing the Delaware River in 1776. 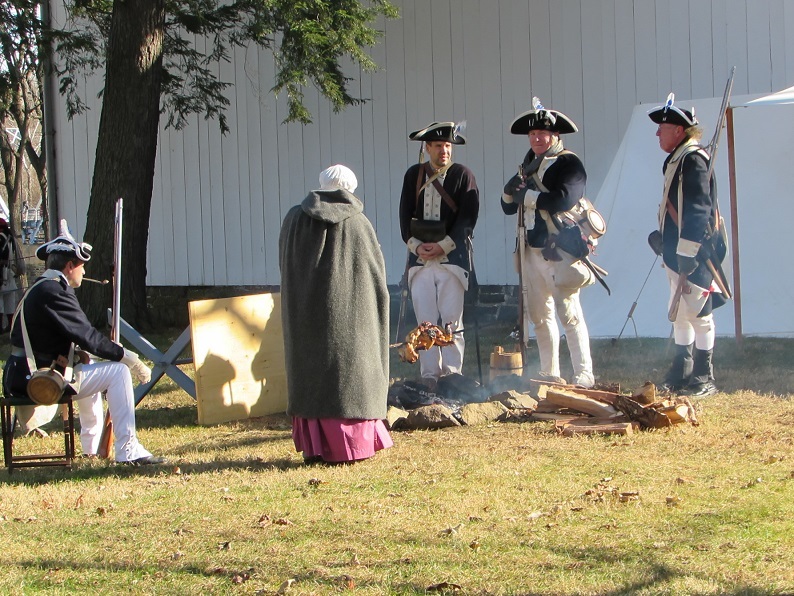 The dress rehearsal, conducted the first Saturday in December and accompanied by the same music, cannon and living history exhibitions as the actual event, is a great alternative for those, like me, who have other obligations on Christmas Day. Or those, also like me, who don’t want to deal with the Christmas Day crowds. The dress rehearsal attracted a lot of people, but nothing like the thousands who watch on Christmas. Late Christmas night in 1776, George Washington took 2400 troops, 18 cannons and over 50 horses across the Delaware River on boats, from Pennsylvania to New Jersey, in a secret attack on the Hessians stationed in Trenton. The crossing was successful (though a few soldiers had to be rescued when they fell into the river), as was the surprise attack the next day. The Continental Army won the Battle of Trenton. Washington Crossing Historic Park, as the park is called on the Pennsylvania side, consists of a visitor center with a small museum, and a historic village near the site (though no one knows the exact site) where Washington crossed. With the exception of a circa 1790 inn, the buildings there now were all built in the early 19th century. So George Washington never saw them, but they’re lovely buildings nonetheless. Also parts of the park but short drives away are an early 20th century watch tower, a building that served as a hospital during Washington’s 1776/77 encampment, and a memorial cemetery for Continental soldiers. The village was cordoned off (it usually is not) during the dress rehearsal and there was an $8 fee (the park is usually free) to get in. We paid, got a paper wrist band, and wandered through the park, which had soldiers marching and camping, musicians playing, and other activities. There was, actually, a lot going on. We were baby-sitting our grand-dog for the weekend and took him with us. The site and the event are dog-friendly. I really, really wanted to see the Crossing so ignored the voice in my head that said, “Stupid idea to take a large, rambunctious puppy into a crowded venue.” I wouldn’t do it again. Enzo was as good as an 8-month-old could be, and he wasn’t even bothered by the musket and cannon demonstrations, but we decided to move him away from the crowds anyway. So we walked across the bridge to the Jersey side, where it was practically empty (didn’t see any exhibits, though we didn’t look either). 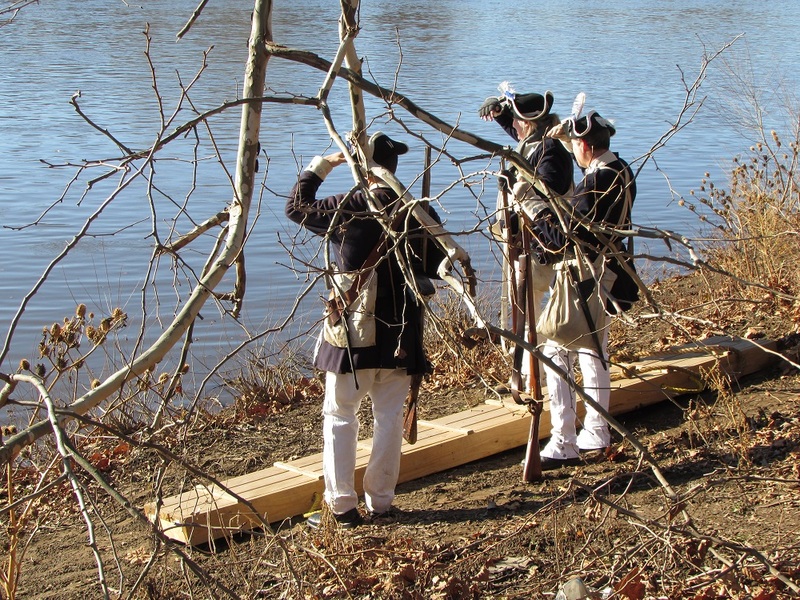 We intended to walk around New Jersey’s Washington Crossing Park until crossing time, and then go back to Pennsylvania. Once we got to Jersey, however, we realized that we’d have a much better view of the crossing from there. The arrival of the three Continental soldiers and their dock, signaling that Washington and his troops would be landing right in front of us, sealed the deal. The first, wayward boat eventually got to shore, albeit about a quarter of a mile further downriver than expected. The soldiers, who had gone down to meet them, return to us, with their portable wooden gangway, and a second, larger boat landed on target. Huzzah! Gallery | This entry was posted in Pennsylvania and tagged dog-friendly, Washington Crossing. Bookmark the permalink. Wonderful pictures, really interesting event! Would love to have seen it, particularly without the suffocating crowds. Kudos on finding such a great viewing spot. Bet Enzo enjoyed it, too. Enzo loved it. There were a bunch of kids there who were more interested in playing with him than watching the crossing.